Gloucester Cathedral, formally the Cathedral Church of St Peter and the Holy and Indivisible Trinity, in Gloucester, England, stands in the north of the city near the River Severn. 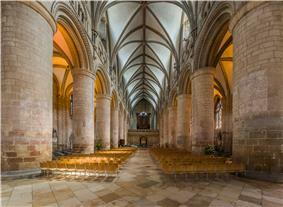 It originated in 678 or 679 with the foundation of an abbey dedicated to Saint Peter (dissolved by King Henry VIII). Wardle records that in 1058 Ealdred, Bishop of Worcester at the time, rebuilt the church of St Peter. The foundations of the present church were laid by Abbot Serlo (1072–1104). Walter Frocester (d. 1412) the abbey's historian, became its first mitred abbot in 1381. 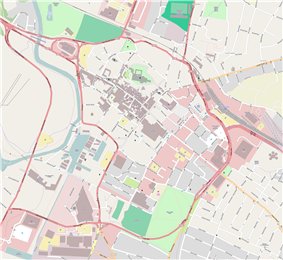 Until 1541, Gloucester lay in the see of Worcester, but the separate see was then constituted, with John Wakeman, last abbot of Tewkesbury, as its first bishop. The diocese covers the greater part of Gloucestershire, with small parts of Herefordshire and Wiltshire. The cathedral has a stained glass window containing the earliest images of golf. This dates from 1350, over 300 years earlier than the earliest image of golf from Scotland. There is also a carved image of people playing a ball game, believed by some to be one of the earliest images of medieval football. The cathedral, built as the abbey church, consists of a Norman nucleus (Walter de Lacy is buried there), with additions in every style of Gothic architecture. It is 420 feet (130 m) long, and 144 feet (44 m) wide, with a fine central tower of the 15th century rising to the height of 225 ft (69 m) and topped by four delicate pinnacles, a famous landmark. The nave is massive Norman with an Early English roof; the crypt, under the choir, aisles and chapels, is Norman, as is the chapter house. The crypt is one of the four apsidal cathedral crypts in England, the others being at Worcester, Winchester and Canterbury. The south porch is in the Perpendicular style, with a fan-vaulted roof, as also is the north transept, the south being transitional Decorated Gothic. The choir has Perpendicular tracery over Norman work, with an apsidal chapel on each side: the choir vaulting is particularly rich. The late Decorated east window is partly filled with surviving medieval stained glass. 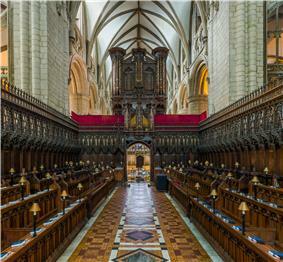 Between the apsidal chapels is a cross Lady chapel, and north of the nave are the cloisters, the carrels or stalls for the monks' study and writing lying to the south. 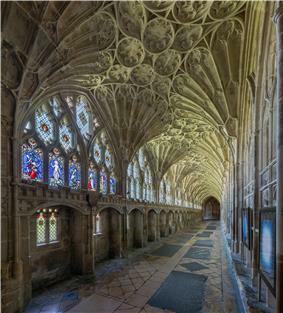 The cloisters at Gloucester are the earliest surviving fan vaults, having been designed between 1351 and 1377 by Thomas de Canterbury. The most notable monument is the canopied shrine of King Edward II of England who was murdered at nearby Berkeley Castle (illustration below). The building and sanctuary were enriched by the visits of pilgrims to this shrine. In a side-chapel is a monument in coloured bog oak of Robert Curthose, eldest son of William the Conqueror and a great benefactor of the abbey, who was interred there. Monuments of Bishop Warburton and Dr Edward Jenner are also worthy of note. Between 1873 and 1890, and in 1897, the cathedral was extensively George Gilbert Scott. The cathedral has forty-six 14th-century misericords and twelve 19th-century replacements by Gilbert Scott. Both types have a wide range of subject matter: mythology, everyday occurrences, religious symbolism and folklore. Facing west towards the choir, with the organ, rebuilt by Henry Willis in 1847, above. In 1582, Robert Lichfield is recorded as the organist of Gloucester Cathedral. Notable among the organists are composers and choral conductors of the Three Choirs Festival, Herbert Brewer, Herbert Sumsion and John Sanders. Edward II of England, seventh Plantagenet king of England (1307–1327). John Wakeman, last Abbot of Tewkesbury and first Bishop of Gloucester (1541–1550). James Brooks Bishop of Gloucester (1554–1558). Richard Cheyney, Bishop of Gloucester (1562–1579). John Bullingham, Bishop of Gloucester (1581–1598). Members of the Hyett family from the 17th and 18th centuries, whose remains were discovered accidentally in November 2015. William Nicholson Bishop of Gloucester (1660–1672). Martin Benson, Bishop of Gloucester (1734–1752). Richard Pate, landowner and Member of Parliament for Gloucester. Thomas Machen, mercer who was mayor of Gloucester three times and one time Member of Parliament for the city. Dorothea Beale, Principal of the Cheltenham Ladies' College, educational reformer and suffragist. The cathedral has been used from as a location for filming the first, second and sixth Harry Potter films. Filming caused some controversy amongst those who suggest that the theme of the films was unsuitable for a church. In 2008, the cathedral was used by BBC Wales as a location for the Doctor Who Christmas special. The cathedral was used as a filming location in the BBC's series The Hollow Crown (an adaption of Shakespeare's Henry IV parts 1 and 2). The interior of the cathedral represented the court of another King Henry, Henry VIII, in the BBC's adaptation of Hilary Mantel's Wolf Hall, first broadcast in January 2015. In 2015, the cathedral was used as a location to film Sherlock. Degree ceremonies of the University of Gloucestershire and the University of the West of England (through Hartpury College) both take place at the cathedral. The cathedral is also used during school term-time as the venue for assemblies (known as morning chapel) by The King's School, Gloucester, and for events by the High School for Girls (Denmark Road, Gloucester), the Crypt Grammar School for boys and Ribston Hall High School. 678-9 A small religious community was founded in Saxon times by Osric of the Hwicce. His sister Kyneburga was the first abbess. 1017 Secular priests expelled; the monastery given to Benedictine monks. 1072 Serlo, the first Norman abbot, appointed to the almost defunct monastery by William I. 1089 Foundation stone of the new abbey church laid by Robert de Losinga, Bishop of Hereford. 1100 Consecration of St Peter’s Abbey. 1216 First coronation of King Henry III. 1327 Burial of King Edward II. 1331 Perpendicular remodelling of the quire. 1420 West End rebuilt by Abbot Morwent. 1450 Tower begun by Abbot Sebrok; completed by Robert Tully. 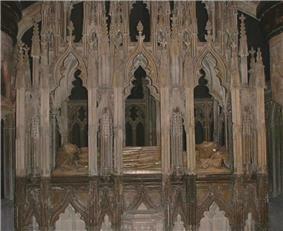 1470 Lady Chapel rebuilt by Abbot Hanley; completed by Abbot Farley (1472–98). 1540 Dissolution of the abbey. 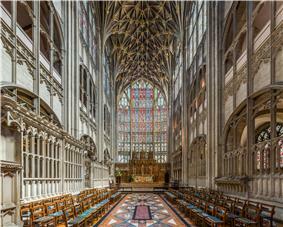 1541 Refounded as a cathedral by King Henry VIII. 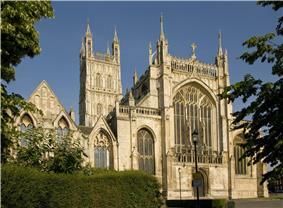 1735–52 Martin Benson, Bishop of Gloucester, carried out major repairs and alterations to the cathedral. 1847–73 Beginning of extensive George Gilbert Scott, architects). 1968 Cathedral largely re-roofed and other major work completed. 1994 Restoration of tower completed. 2000 Celebration of the novecentennial of the consecration of St Peter’s Abbey. ^ IT was a case of 'once more into the breach' for Gloucester Cathedral which has provided the backdrop for another star studded drama. ^ "The Stately Homes of Wolf Hall", BBC website.